Additional laminated A4 pages that fit our Barrier Wallets. We can supply alternative designs or you can make your own. Designed to be written on with an indelible pen. Solvent based waterproof pen for use on Laminated Safety Signs to identify the hazard. The ink can be removed with a mild kitchen cleaner or solvent. A buckled loop of webbing which includes a polycarbonate part that allows The Quick Barrier to remain vertical while attached to horizontal posts. Easily attached to The Quick Barrier when required. Designed to stop the wallet from moving on The Quick Barrier, this can be fixed to the wallet using the Velcro supplied. The webbing can also be stored around the webbing holder if required. 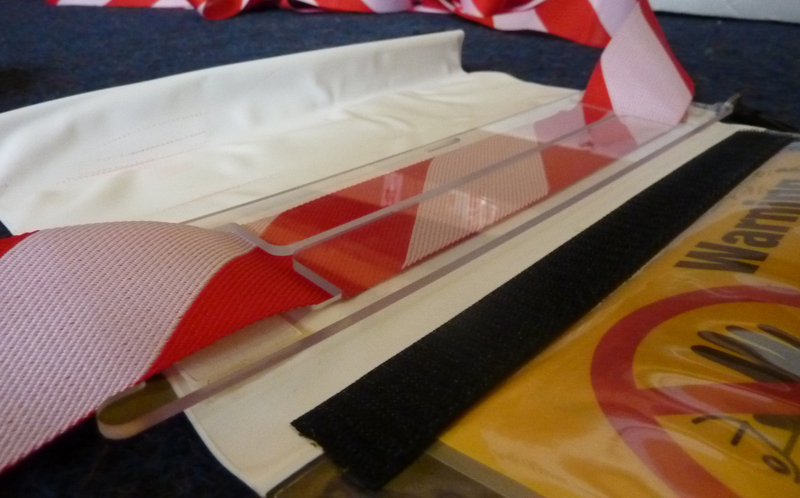 A clear bottom opening PVC wallet which can be used with the Quick Barrier or W.A.S.P system. The Wallet features welded Velcro closure strips and tabs for the bottom opening and to secure it when rolled up.